Acura has established a reputation of being a luxury Japanese automotive manufacturer. The ZDX series is one of their recent models that was actually their first car designed on U.S. soil. Used Acura ZDX’s tend to sell the moment they are listed due to their popularity and lower price compared to a new ZDX. The initial production model debuted in 2009, but the manufacturer plans on discontinuing the line at the end of 2013. Existing models come with just one engine option. 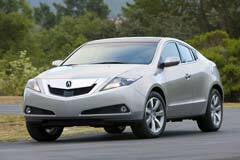 All Acura ZDX models run on a 3.7 liter V6 engine and with a 6 speed automatic transmission. Ride and handling are controlled by a four-wheel drive system. Amongst its signature design features, the Acura ZDX has prism shape headlights with a subtle grill in the middle and two small aid vents. It also comes with a panoramic glass roof with movable sunshades and all leather interior. From a technology perspective, Acura included a Navigation System, voice recognition and a premium audio system. 2012 Acura ZDX Premium 2012 Acura ZDX, low mileage (30,500 current). 30,000 mile service completed. 2010 Acura ZDX Technology uper Rare and MINT 2010 Acura ZDX Technology Grigio Sumatra 84xxx miles!